In this edition we welcome a new staff member to our team, showcase local council “Beat the Heat” initiatives, announce a new project to help Councils develop Flying Fox Camp Management Plans, highlight key datasets available to Councils for conservation assessment and planning, and update you on the many initiatives being delivered through the Regional Waste Program. Roadside Project Reaches Finish Line! Help Us Deliver the Training You Want! Anna Lundmark has joined the Environment Division team as Regional Program Manager (Contaminated Land). Anna will work directly with Councils to review and improve their local contaminated land systems and processes. Anna has been working in the contaminated land field since 2004 and is a Certified Practitioner – Site Assessment and Management (CP SAM) under the Site Contamination Practitioners Australia (SCPA) Scheme. Prior to joining Hunter Councils, Anna was a Principal Environmental Scientist with AECOM, mainly working with contaminated land audits. Anna has extensive experience in contaminated site assessments, remediation and management, ecotoxicology, water management, compliance monitoring of air and water, and project management. Great news! Two regional funding applications submitted to the State Government have recently been approved. These funds will enable us to directly support Councils plan for the management of local Flying Fox camps, and to more effectively and consistently communicate with and educate local communities about Flying Foxes. The first grant of $95,000 will directly support Mid Coast, Port Stephens, Cessnock, Maitland, Singleton, Muswellbrook, Upper Hunter and Central Coast Councils develop new Flying Fox Camp Management Plans, or to map and update their existing camp management plans. For the first time, this project will also produce regional Flying Fox habitat mapping, and deliver specialist training to Council staff on strategies for effectively engaging and consulting local communities affected by Flying Fox camps. This work will also complement other grants awarded under the same program directly to Cessnock and Lake Macquarie City Councils. The second grant of $100,000 has been received from the NSW Environmental Trust’s Environmental Education Grants Program. This will facilitate the development and implementation of a regional Flying Fox community awareness and engagement strategy, across 11 council areas, including a Flying Fox Resource Kit, staff training, rollout of a flying fox decision-support tool, and direct engagement and capacity building of affected residents and community groups. Congratulations to Maitland City Council, who were recently awarded the “Overall Regional Sustainability Award” at this year’s Blue Star Sustainability Awards. Maitland received four category awards as well as the overall award. Congratulations also to Midcoast Council who received three awards and Port Stephens Council who received two. These awards have grown out of the Sustainable Cities, Clean Beaches and Tidy Towns Awards Programs, and recognise and celebrate the hard work of NSW citizens who promote responsible environmental management in their local area. The Regional Heatwave Resilience project has been selected as a finalist in the Climate Change category of this year’s NSW Local Government Excellence in the Environment Awards. Winners will be announced at the Awards Ceremony on 29 November. With the weather warming up, both Newcastle and Dungog Councils are using the regional “Beat the Heat” Communication resources, created under the Heatwave Resilience project, to improve the safety of Council staff. Copies of the “Are You Drinking Enough?” Urine Colour Chart have been placed on or in Council trucks and machinery, with Newcastle City Council adapting it into an A5 magnet especially for this purpose. We are actively working with the NSW Office of Environment & Heritage to ensure production of a reliable vegetation map across the region. Four workshop sessions were recently held for Council staff to review draft mapping developed for the Upper Hunter and Manning areas. OEH are planning to release the updated draft Upper Hunter Plant Community Type map prior to December 2016, followed by a 3-month consultation period prior to final publication. We will continue to work with councils to collate and provide input during the consultation period. Workshops have recently been delivered to over 50 council staff to demonstrate use of the large body of Biodiversity data sets we released in 2015. Created under the four-year Biodiversity Investment Prospectus project, this data includes climate projection modelling, species and vegetation community modelling, and agricultural lands mapping. All datasets are now freely available on our website. Roadside EEC Project Reaches Finish Line! A two year project to improve native species diversity and condition of Endangered Ecological Communities (Lower Hunter Spotted Gum Ironbark, Hunter Lowland Redgum and Central Hunter Ironbark-Spotted Gum-Greybox Forest) along 41 kilometres of roadsides, at 14 project sites across the Port Stephens, Maitland and Dungog Council areas has been completed. Funded by the NSW Environmental Trust, the project achieved an 80% to 95% reduction in high priority weed infestations including Lantana, Bridal Creeper, and Asparagus Fern. 124 hollow bearing trees with the potential to provide habitat for a range of native species. The project also delivered a Weed Blitz Weekend, Weed Identification and Control Workshop, and Endangered Fauna Workshop to raise awareness among local residents of the value of roadside and other vegetation in their local area, and to encourage landholders to actively control weeds on their own properties. With assistance from our member Councils and Local Government Legal, we have prepared a regional submission to the NSW Government’s Draft Container Deposit Scheme (CDS) Bill and Regulatory Framework Discussion Paper. The NSW CDS aims to reduce litter by putting a 10 cent value on containers sized 150mL – 3L, with some exceptions. While the submission identified a number of key issues for the EPA’s consideration, overall it confirmed the Councils of the Hunter Waste Region are supportive of the introduction of the CDS and see the re-introduction of the Scheme in NSW as a positive way for the community to actively engage in litter reduction and resource recovery. Waste audits of the on-campus residences at the University of Newcastle’s Callaghan Campus have recently found that up to 67% of all waste in the red-lidded bins is food waste. To address this wastage, our “Love Food on Campus” project recently treated students to a cooking demonstration by Chef Daniel from ‘Fork’n’Knife’. The demonstration focused on cooking basics, creating delicious recipes from staple ingredients, and cooking strategies that reduce food waste. In early September senior staff from the NSW EPA Organics Unit were taken on a two-day tour of key organics processing facilities in the region. This tour enhanced communication between EPA and council staff; discussed current and planned collection and processing systems, and explored pathways to create increased demand and end markets for compost and mulch products.The opportunity to get “down and dirty” allowed EPA staff to see the day-to-day practicalities and issues at our region’s organics processing facilities. The tour engaged with over twenty council waste management staff, as well as representatives from Hunter Local Land Services, NSW EPA and industry representatives. The outcomes are now informing development of a longer-term plan to address recycled organics (garden and food waste) issues across the region. Litter reduction projects at three recreational parks are now well under way. Locations include The Basin (Cessnock), Medowie Skate Park (Port Stephens), and the Upper Reserve Fields at Wallsend (Newcastle City Council). Delivered under the EPA funded Regional Recreational Parks Litter Project, these projects aim to build collaborative partnerships with local sporting groups and schools, enhance bin infrastructure and improve signage to encourage park users to ‘Put it in the Bin’. Mount View High School, Cessnock Minor Rugby League, Wallsend Touch Football Association and Cessnock Touch Football Association are actively participating in the projects. The September launch of The Basin project saw over 100 Year 8 students and staff from Mount View High School conduct a clean up that collected over 500 Litres of litter! The 2016 Garage Sale Trail was held on 22 October 2016, which unfortunately coincided with very wet weather in our region. Figures on the final number of registered sales are yet to be released, but due to the rain we anticipate they will be slightly down on last year. Because of the rain, the Garage Sale Team are proposing that sellers hold another sale over the coming weeks, and are providing updated promotional materials (without a specific date) on the Garage Sale Trail website. Our purchase of the regional `Garage Sale Trail” delivery package this year meant that Councils were able to participate in this initiative at no direct financial costs to themselves. The HCCREMS Professional Development Series aims to bring professional training opportunities directly to our region for the benefit of member Councils and partner organisations. We are now planning our 2017 course program, and would welcome your input on what courses you would like to see scheduled. To do so, please complete our short survey by clicking on the ‘read more’ button below. Parallel sessions focusing on ”Resilient Communities”, “Adapting NSW Coasts”, “Climate Change and Biodiversity” and “Innovative Adaptation”. Delivered by renowned Placemaker Andrew Hammonds, this training event will provide participants with an understanding of the theory, principles and process of placemaking and urban design. It will provide an interactive combination of theory, workshops and site visits. It is highly relevant to Council and agency staff and consultants involved in urban design, land use planning, development assessment, architecture, landscape design, asset design and management, community land and open space management and economic and community development. Here at the Environment Division we manage an extensive repository of local and regional spatial data and mapping resources, developed and updated over many years, which are available to our member Councils. Resources cover a range of parameters including: Soil Landscapes, NPWS Atlas, Species Distribution Models, Conservation and Connectivity, Endangered Ecological Communities and Threatened Species, Agricultural Land, Land Tenure, Climate Change Mapping & Modelling, Climactic variables, Water Features and Topography. To highlight the resources we or our Councils have access to, each newsletter will now profile a different mapping resource that is available. This month we profile “NSW Woody Vegetation Extent 2011”. The custodian of this data is the NSW Office of Environment & Heritage. The government has also announced a $500 million funding package and released two draft climate change and energy savings plans for public consultation. Three webinar briefings to provide more information about the funding opportunities under these two draft plans, the public consultation process and the new climate change policy framework have been scheduled for 16 November, 23 November and 1 December 2016. Calls for a radical change in the way we manage natural disasters. By investing in resilience, we will save lives and money. Identifies that disasters cost Australia $9 billion last year, and costs the world more than $200 billion annually. Yet just one out of every eight dollars spent on disasters goes towards reducing risks. Advocates that by investing in resilience, governments and communities could save lives, prevent human suffering and save billions in recovery costs and economic losses. Confirms that the Living Planet Index, which measures biodiversity abundance levels based on 14,152 monitored populations of 3,706 vertebrate species, shows a persistent downward trend. Identifies that our use of natural resources has grown dramatically, particularly since the mid-20th century, and as a result, we are endangering the key environmental systems that we rely upon. Recommends design responses that can shift us toward sustainable and resilient modes of production and consumption, consistent with the United Nations 2030 Agenda for Sustainable Development. Cool Stuff in Our Region! 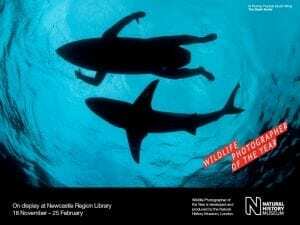 The world-renowned “Wildlife Photographer of the Year” exhibition, on loan from the Natural History Museum in London, will open at the Lovett Gallery (Newcastle Region Library) on 18 November 2016. The exhibition features 100 awe-inspiring images, from fascinating animal behaviour to breath-taking wild landscapes. “Wildlife Photographer of the Year” is the most prestigious photography event of its kind, providing a global platform that has been showcasing the natural world’s most astonishing and challenging sights for over 50 years. This year’s competition received a record 50,000 entries from 96 countries. But its not just about pretty pictures, the exhibition also highlight some of the big questions for society and the environment: How can we protect biodiversity? Can we learn to live in harmony with nature? We highly recommend a visit. Entry is by gold coin donation.